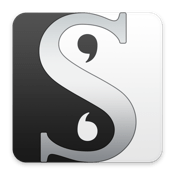 Scrivener is a very intuitive and easy to use program aimed at authors of books or newspapers and/or for research projects and several other writing related job. Therefore Scrivener has built-in some very special functions that allow you to streamline your workflow! I will stop saying anything now, watch the screencast! Those who tell us how they will use Scrivener will win one of three free serials! Can’t wait to get an acknowledgment that you have one a license? Use our coupon code OSXCAST when buying and get 20% off the price of Scrivener! The winners will be chosen randomly, after the giveaway has expired. After that date the winners will be notified via email. Therefore it is needed to enter an active email address into the address field. Please remember that your address will not be given to third parties — except you are one of our lucky winners.